Alonti’s Pecan Pesto has been a favorite of mine for a long, long time. 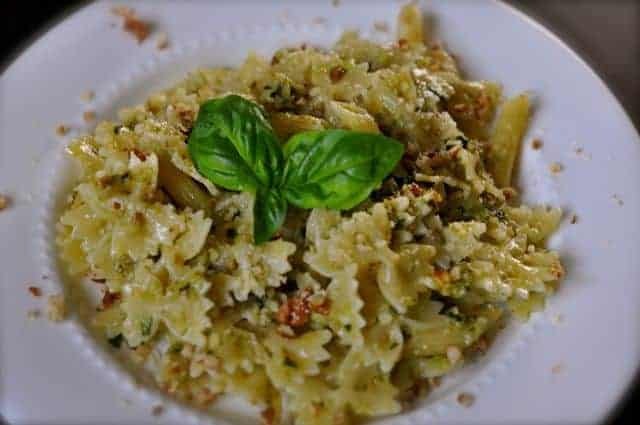 Pesto is a wonderful sauce to make for pasta or even to serve with a grilled meat. One of the major drawbacks for pesto is the expense of the pine nuts Alonti’s has been making their pesto with pecans instead of pine nuts, and it is quite frankly incredible. As the summer begins to wind down, I am enjoying the last of my basil plants for this summer. Every year I grow a couple of basil plants and the weather is just beginning to cool off, and I know that my personally harvested basil is coming to a close. During the summer I often make salad caprese, and pesto. I think the 20 dollar a bag pine nuts at Costco made me whence too much, and made me think of Alonti’s. I honestly eat there about once a week. One of my favorite items there is their pesto made with pecans. If you have never made pesto, I promise it is very easy. A food processor is the tool you want to use. Armed with some good quality extra virgin olive oil, fresh garlic, nuts, and some Parmesan cheese, and you can make pesto in under five minutes. It will take you longer to cook the pasta than to make the pesto. Altonti's Pecan Pesto is a great take on traditional pinenut pesto, this pesto is made with pecans. Wash basil leaves and place into a food processor with the olive oil and garlic. Pulse several times until the garlic begins to break into small pieces. Add kosher salt and pecans and process briefly at medium speed, then add cheese and pulse until the cheese is mixed uniformly through.Pour pesto over cooked pasta and mix well. If you don't intend to eat all of the pesto at once, store remaining pesto in an air tight container, it will remain fresh for a couple of days. I’m so glad to find this recipe. I used to have this for lunch at least 2-3 times a week at the Oakbrook, IL location. I retired and moved to AZ, when I returned for a visit I found they were gone. Oh no! Alonti’s Pecan Pesto is calling me….sounds so good and easy too. I just bought some chickpea rotini and I think it will be a great supper. Thanks so much for the CopyCat Recipe even though I’ve never been to Alonti’s. Do you think I could try this Pecan Pesto on Roasted Cauliflower or Zucchini! YUM! The pecan pesto looks fab — but what & where is Alontis? They are in Houston, and Dallas. In Houston they are in the Greenway Plaza, and the Wortham Building in the AIG building complex.